For the last seven seasons, Jonas Valanciunas has held down the center position for the Toronto Raptors. 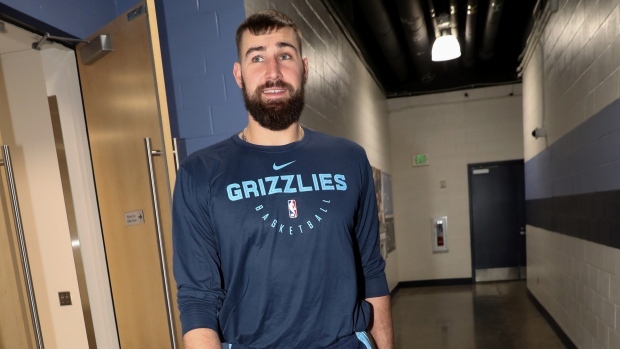 After being drafted with the 5th overall pick in 2011, he’s never known another NBA franchise until now, following his inclusion in the trade package to the Memphis Grizzlies for Marc Gasol. While Raptors fans begin the process of getting familiar with Gasol, the former All-Star who, like Valanciunas, had only known one team before Thursday’s trade, there is little doubt that Valanciunas will be missed. He wasn’t a superstar in the way that Kyle Lowry or DeMar DeRozan were, but he was a constant at the center position, starting almost every game he played for the Raptors until moving to the bench this season with little fuss at new coach Nick Nurse’s request. Early Sunday morning, Valanciunas posted a touching message to his Instagram account, thanking everyone from his teammates and coaches to the team’s therapists and arena staff to, of course, the fans and the city. Close to 7 years ago I came to Toronto for a reason. I came for the people, for the Raptors organization, for the city. Thank you guys for believing in me, for drafting me in 2011. It’s a long list of people in Toronto I want to thank. Trainers, front office, arena staff, therapists, my teammates and of course my coaches. Thank you to everyone who helped me in Toronto to go out, compete and play basketball. Through good times or bad times, Toronto fans stood by me from day 1, trusted me so thank you! You have no idea how much I appreciate it. It’s clearly a time of change in Toronto, as Masai Ujiri is making an aggressive push to advance further in the playoffs after years of too-soon playoff exits. Gone are familiar faces such as Valanciunas, DeRozan and Dwane Casey. New faces such as Gasol, Nurse and Kawhi Leonard light a new path forward, but that doesn’t mean that these old faces won’t be missed. In Memphis, Valanciunas will have a chance to take center stage for a lowly team alongside a rookie standout in the frontcourt, Jaren Jackson Jr. If he opts out of his $18 million option for next season, he will be a free agent. Meanwhile, Gasol made his Raptors debut on Saturday night, being eased into his new surroundings with 7 points and 6 rebounds in 19 minutes.